Pdi uses GMB for their choice in water pumps. GMB proudly announces that all principal component parts are designed, manufactured and tested in house, such as bearings(life), impellers (pumping water), mechanical seal kits(sealing) and housings(ruggedness). Integration of these parts through our experience and accumulated knowledge shall lead to total quality assurance, unsurpassed by anybody else. 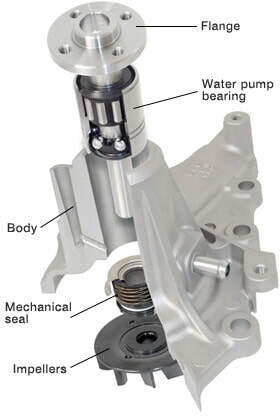 GMB water pumps consist of the body (aluminum diecast, cast iron, aluminum gravity etc), flange (forged steel, sintered iron etc), impeller (pressed steel, cast iron, synthetic resin etc), water pump bearing and mechanical seal kit.